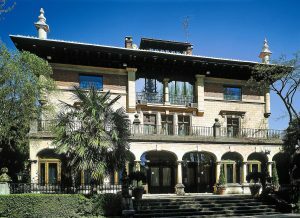 The beautiful Ajuria Enea palace is the official house of the Basque Government’s President since 1980. It is located in one of the main residential neighbourhoods in Vitoria. The palace was built in 1920 at the request of Serafín Ajuria, an industrialist of the city. Its outer appearance presents all the architectural features of Neo-Basque art: double series of arches on the ground floor, three central large windows united by balcony spaces and heraldic elements on the first floor, semi-circular arched windows with cylindrical corners crowned with flying buttresses on the upper floor, and a beautiful eave finished with nice pinnacles raised towards the sky on the roof. After being the residence of the Ajuria Family, in 1966 the palace became an educational institution of the Madres Escolapias religious order. Six years later, the Regional Council of Alava bought it in order to establish a Basque art museum there. It opened in 1978. Once decided that the palace would host the President’s house it was restored. Access to the Ajuria Enea is restricted.